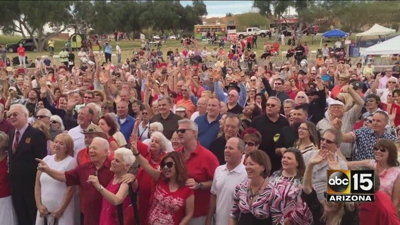 Hundreds of couples spent their Valentine’s Day saying “I do” all over again in Fountain Hills. Two weeks ago, hundreds of married couples gathered at Fountain Hills Park in Fountain Hills, Arizona to renew their wedding vows. The fourth-annual event was one of the world’s largest vow renewal ceremonies. More than a mere ceremony, the free event in Fountain Hills also featured a newlywed-style game as well as refreshments. There are many reasons a couple might want to renew their vows. They might want to celebrate a significant anniversary or simply want to reaffirm their love for each other. Sometimes a couple’s reasons may be bittersweet. For example, some couples renew their marriage vows to symbolically reset their relationship after one or the other partner has been unfaithful. Dean McDermott has expressed a desire to renew his vows with Tori Spelling after having an affair, and “19 Kids and Counting” star Josh Duggar has expressed a similar wish to be reunited with his wife Anna, though some believe Anna is considering leaving Josh for good. Exodus 34 might be read as something of a “renewal of vows” after an incident of infidelity. This profound revelation of God’s compassion and mercy comes on the heels of Israel’s moral failure with the golden calf. Although there is a price to pay for human sin, divine grace carries the day. Moses experiences a powerful experience of God’s presence on Mount Sinai. There, he hears God’s proclamation of compassion, mercy, patience, loyalty, and faithfulness to Israel. In the end, the broken covenant is renewed, and God and the people move forward together. Christians are often guilty of assuming that “the God of the Old Testament” is a stern, harsh lawgiver and that grace only comes into the picture with the coming of Jesus. Exodus 34 challenges this stereotype, depicting God’s compassion and mercy at precisely the time Israel deserved it the least. Czarmecin, “Josh Dugger & Anna Divorce: Anna Agrees to Renew Wedding Vows when Josh Returns from Rehab,” Parent Herald, 2 December 2015, http://www.parentherald.com/articles/13483/20151202/josh-duggar-anna-divorce-agrees-renew-wedding-vows-when-returns.htm. “Dean McDermott Wants to Renew Vows with Wife Tori Spelling More than a Year after Affair,” Lifestyle Weekly, 6 May 2015, http://www.lifeandstylemag.com/posts/dean-mcdermott-wants-to-renew-vows-with-wife-tori-spelling-more-than-a-year-after-affair-57737. Keith Dent, “5 Things Men Must Do to Save Their Marriage after Infidelity,” The Good Men Project, 19 January 2016, http://goodmenproject.com/featured-content/5-things-men-must-do-to-save-their-marriage-after-infidelity-ajrt/. Catherine Mejia, “Hundreds of Couples Renew Vows in Fountain Hills on Valentine’s Day,” ABC15.com, 14 Feb 2016, http://www.abc15.com/news/region-northeast-valley/fountain-hills/hundreds-of-couples-renew-vows-in-fountain-hills-on-valentines-day, accessed 17 Feb 2016. • If you are married, have you and your spouse ever renewed your wedding vows? What was the occasion? What did the experience mean for the both of you? • What is the most profound act of forgiveness you have ever observed in a marriage, either your own or someone else’s? • What does it take to offer mercy and compassion to someone who has hurt us? • If Exodus 34 is right about what God is like, how should we respond to such a God when we sin? The Heb. root hanan, “be gracious,” requires at times the sense of extending mercy (Deut 7:2; Pss 51:1; 123:2-4). Mercy in this case is the undeserved and gracious favor of the superior to the inferior. Raham and its derivatives express the emotional aspect of mercy, the feelings of compassion and pity (Exod 33:19; Isa 30:18). The noun rahamim, “compassion,” first referred to the bowls, the seat of feeling (Gen 43:30; 1 Kgs 3:26; cf. RSV “heart”). Both hamal (Exod 2:6) and hus (Deut 7:16) mean “to have pity or compassion” (cf. Jer 13:14; 21:7). Stephen J. Andrews, “Mercy,” Mercer Dictionary of the Bible, ed. Watson E. Mills et al. (Macon GA: Mercer University Press, 1990), 567. Chapter 34 is a continuation of chapter 32. It describes the renewal of the covenant following the golden calf incident. The Lord told Moses to cut two stone tablets like those he had broken and bring them to the top of the mountain to be inscribed with a new copy of the commandments (34:1-3). After Moses had climbed the mountain, the Lord descended in a cloud to meet him. Moses was then given a proclamation of the divine name and an interpretation of its meaning [34:6-7]…. These verses furnish a clear statement of Israel’s covenant theology. They give a balanced view of God’s sovereignty and Israel’s freedom and responsibility. Moses’ response to God’s self-revelation served as a model for all future generations of Israelite worshipers: “And Moses quickly bowed his head toward the earth, and worshiped” (34:8). He also uttered a bold request that the Lord might accompany this stiff-necked people on their journey from Sinai (34:9). The Lord’s response was an announcement of the renewal of the covenant (34:10). Page H. Kelley, Journey to the Land of Promise, All the Bible (Macon GA: Smyth & Helwys, 1997), 83-84.